Quilt Canada 2019 in Ottawa. The Keynote speakers and instructors are in place for Quilt Canada 2019 in Otawa. Teachers: Libs Elliot, David Taylor, Anna P. Brasil, Krista Hennebury, Carol Seeley, Tamara Serrao, Anndrea Tsang Jackson, Lauren Mac Donad, Amanda McCavour, Claire Halliot, Bill Stearman, Bridgit O’Flaherty, and Laua Coia. Please go the the CQA web site to view the QC2019 Teacher/Lecturer Biographies. Detailed informaton about workshops, lectures and schedules will be posted on the website in October. Registraton will open in January 2019. BIG NEWS! The final tally is in for the funds raised from the Postcard Challenge with the proceeds going to the BC Children ’ s Hospital. $11,000!Huge shout out to Cindy’s Threadworks for the idea and sponsorship! AND to Karen Killins – Robinson who ran the challenge! The biggest thank you goes to all of you who created and purchased the postcards to make this happen! THANK YOU!! Quilt a Row Quilt Along . See Guild and Community News tab for more information. Pin Cushion Instructional YouTube Videos and Labels have been added to the Quilt Show page. 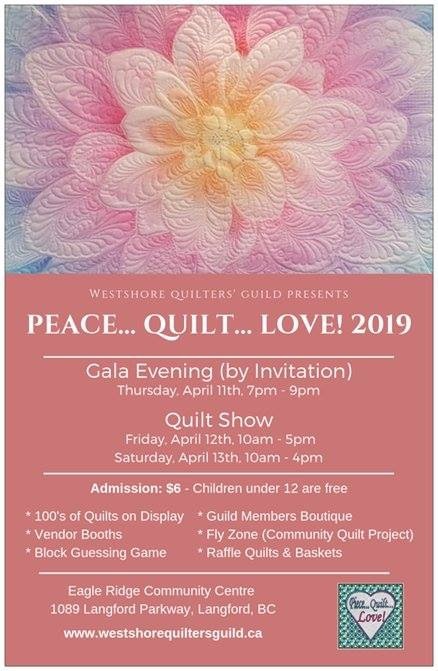 Search YouTube with Westshore Quilters Guild to find all our videos.